Immersed in exotic locales across four continents, best selling author Dinesh D’Souza races against time to find answers to Obama’s past and reveal where America will be in 2016. During this journey he discovers how hope and change became radically misunderstood, and identifies new flash-points for hot wars in mankind’s greatest struggle. The journey moves quickly over the arc of the old colonial empires into America’s empire of liberty, and we see the unfolding realignment of nations and the shape of the global future. A word about anti-colonialism: D’Souza has been pushing this idea that the Democrats hold anti-colonial views ever since his 2002 book, “What’s So Great About America?”. Anti-colonialism is basically the same thing as anti-imperialism. Anti-imperialism simply means opposition to wars of conquest, like early Americans’ opposition to British rule. It is not synonymous with terms like socialism, communism, or any other extreme philosophical view. The filmmakers certainly wants the viewer to think this is some extreme, scary philosophical perspective. Nevermind the fact that one is hard-pressed to find any positions, let alone actions, that would indicate that Obama has some kind of extreme secretive philosophical perspective. A couple of years ago I called into the Sean Hannity show. I criticized Hannity for his irresponsible rhetoric about President Obama. Hannity’s most recent book alleges that Obama is a socialist. Obama had recently signed this 2009 stimulus bill into law, which is made up of a huge number of tax cuts to lessen the financial burden on taxpayers. 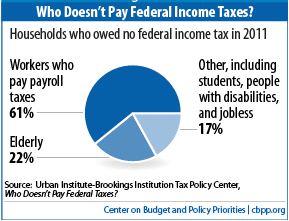 The tax cuts would affect 98% of taxpayers. I asked Hannity, “do you really believe Obama is a socialist?” His answer was, “yes, yes I do.” My response to Hannity was: I don’t know if you have read Obama’s book, “The Audacity of Hope,” but it outlines a number of Obama’s positions – and he is clearly a believer in the free market and the role of small businesses in creating jobs. Also, I asked, “does a Socialist give 98% of Americans tax cuts?” Hannity hung up on me and did not answer the question. Like Hannity, D’Souza is attempting to scare viewers with a misunderstood label into thinking their president has a hidden agenda and he means to harm them in some way. This is the epitome of poor journalistic standards. Below, I have included a number of critical reviews of the film “2016: Obama’s America.” Nearly every review that I found on this film ripped the film apart as being completely irresponsible. I am also including some additional responses to some of the issues raised in the film, such as Obama’s relationship with Israel. “‘Oppression studies, if you will. Obama got plenty of that when he was here in Punahou,” D’Souza says, standing on the campus in Honolulu. In Kenya, D’Souza interviews Philip Ochieng, a lifelong friend of the president’s father, who claims the elder Obama was “totally anti-colonial.” Ochieng also discloses some of his own political views, complaining about U.S. policy in Afghanistan and Iraq and saying the U.S. refuses to “tame” Israel, which he calls a “Trojan horse in the Middle East.” D’Souza seems to suggest that if a onetime friend of Obama’s late father holds those opinions, so, too, must the president himself. 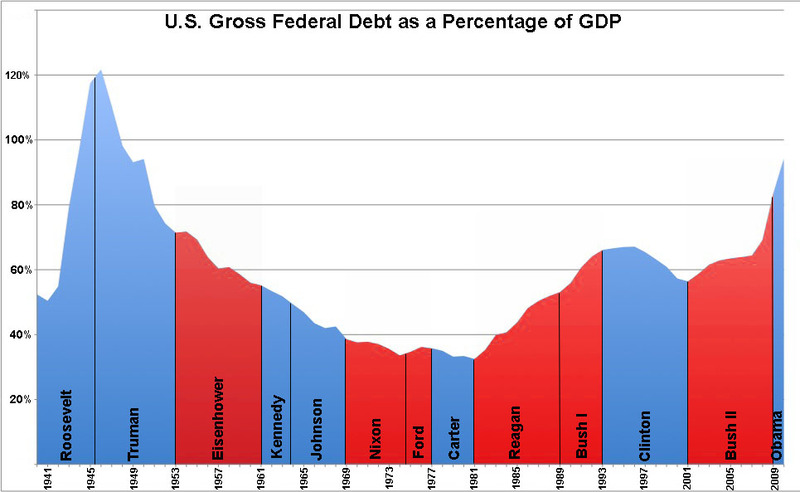 D’Souza rightly argues that the national debt has risen to $16 trillion under Obama. But he never mentions the explosion of debt that occurred under Obama’s predecessor, Republican George W. Bush, nor the 2008 global financial crisis that provoked a shock to the U.S. economy. D’Souza says Obama is “weirdly sympathetic to Muslim jihadists” in Afghanistan and Pakistan. He does not mention that Obama ordered the raid that killed Osama bin Laden and the drone strikes that have killed dozens of other terrorists in the region. D’Souza wrongly claims that Obama wants to return control of the Falkland Islands from Britain to Argentina. The U.S. refused in April to endorse a final declaration on Argentina’s claim to the islands at the Summit of the Americas, provoking criticism from other Latin American nations. D’Souza says Obama has “done nothing” to impede Iran’s nuclear ambitions, despite the severe trade and economic sanctions his administration has imposed on that country to halt its suspected nuclear program. Obama opposes a near-term military strike on Iran, either by the U.S. or Israel, although he says the U.S. will never tolerate a nuclear-armed Iran. Reverend Jeremiah Wright, described as Obama’s surrogate father. D’Souza’s film paints Obama as being against Israel and pro-Islam. In reality, Obama is pro–Middle Eastern peace, while at the same time he recognizes the historic and strategic importance of our alliance with Israel. Here is some of the evidence of Obama’s support for Israel. As president, he responded by providing full financing and technical assistance for Israel’s Iron Dome short-range anti-rocket defense system, which is now protecting those villagers. In July, he provided an additional $70 million to extend the Iron Dome system across southern Israel. That’s in addition to the $3 billion in annual military assistance to Israel that the president requests and that Congress routinely approves, assistance for which Prime Minister Benjamin Netanyahu has expressed deep personal appreciation. He has increased aid to Israel and given it access to the most advanced military equipment, including the latest fighter aircraft. Ask any senior Israeli official involved in national security, and he will tell you that the strategic relationship between the United States and Israel has never been stronger than under President Obama. “I can hardly remember a better period of American support and backing, and Israeli cooperation and similar strategic understanding of events around us,” the defense minister, Ehud Barak, said last year, “than what we have right now.” That cooperation has included close coordination by intelligence agencies — including the deployment of cyberweapons, as recent news reports have revealed — to thwart Iran’s nuclear ambitions. Mr. Obama secured European support for what even Iran’s president, Mahmoud Ahmadinejad, called “the most severe and strictest sanctions ever imposed on a country.” He has also taken the option of merely “containing” a nuclear-armed Iran off the table. He has directed the military to prepare options for confronting Iran and has positioned forces in the Persian Gulf to demonstrate his resolve. Mr. Obama has been steadfast against efforts to delegitimize Israel in international forums. He has blocked Palestinian attempts to bypass negotiations and achieve United Nations recognition as a member state, a move that would have opened the way to efforts by Israel’s foes to sanction and criminalize its policies. As a sign of its support, the Obama administration even vetoed a Security Council resolution on Israeli settlements, a resolution that mirrored the president’s position and that of every American administration since the 1967 Arab-Israeli war. The film makes the allegation that Obama is trying to bankrupt the United States by increasing its deficit spending and national debt. This is a ludicrous claim, given that most of his deficit spending was from spending that Bush budgeted for, or put in place with TARP, or was part of the 2009 stimulus plan to revive the worst economy since the Depression. The 2009 stimulus package was a similar approach to what both Democrats and Republicans doing during severe recessions (when consumers stop spending, the government spends to get the economy going again). 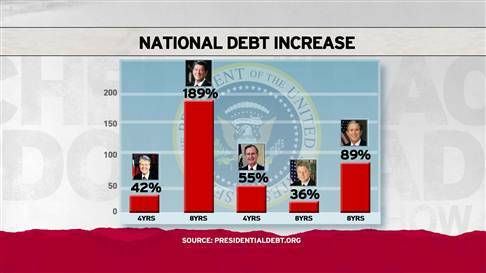 Here is a historical comparison of spending by recent presidents, who of course create a budget which is approved by Congress. IS OBAMA TRYING TO WEAKEN THE U.S.? D’Souza alleges that Obama has an agenda to weaken America by decreasing military spending. This allegation is absolutely wrong. 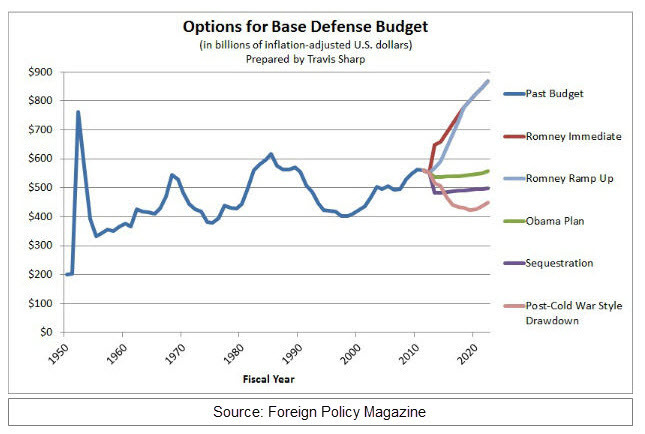 Here is some data on this (notice that Romney wants to increase military spending to unprecedented levels, especially in a time a relative peace). Obama has made efforts to try to reduce nuclear arms in the world, including the new START Treaty. His position on nuclear weapons reduction is exactly the same as Pres. Ronald Reagan. According to the conservative Heritage Foundation, Reagan “was an ardent proponent of the abolition of nuclear weapons”; and “he never abandoned his hatred of nuclear weapons and his desire to eliminate them. Reagan’s ‘dream,’ as he himself described it, was ‘a world free of nuclear weapons.’ He pursued that dream as a personal mission.” Moreover, “he and Gorbachev signed the INF Treaty in 1987, which eliminated an entire category of nuclear weapons for the first time, and he laid the foundation for President George H.W. Bush to complete the first Strategic Arms Reduc­tion Treaty.” (Source: http://www.heritage.org/research/lecture/president-reagans-legacy-and-us-nuclear-weapons-policy). This is a perfect example of how many Conservatives will praise Reagan in for a position while criticizing Obama for holding the exact same position. It is both evidence that Conservatives are moving further and further to the right, and that their followers care little about facts, and many simply follow along sheepishly with whatever rhetoric they are fed from their propaganda sources. Look, D’Souza is an ideologue; that is, someone who is extremely dogmatic and has a strident point of view and will ignore facts that contradict their view. This film is a classic propaganda piece—one that many conservatives have even condemned. 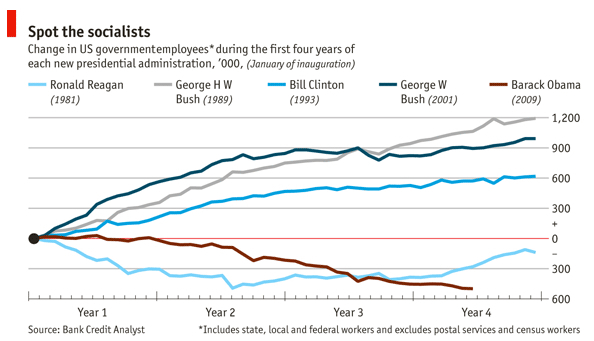 The reality is that Obama is a good family man with excellent values, including unquestionable support for business. He is patriotic and his positions are squarely in the center of the political spectrum. The GOP has moved further and further to the right of the last 15 years, which makes a centrist like Obama seem more liberal. Yet many of his positions are not unlike Ronald Reagan. He does not support extreme redistribution, he is not a socialist, and he is not an anti-colonialists in sense that D’Souza uses that term. I would invite you go watch a couple of Michael Moore movies. I think this experience would allow you to see what this kind of one-sided propaganda film looks like on the other side. For example, watch Fahrenheit 911. It basically does the same thing to Bush as you see 1916 doing to Obama (and D’Souza admits that Michael Moore was an influence in how he made this movie). It carefully leads the viewer to see Bush as having close ties to the Saudis, and by extension, the Bin Laden family. It also makes connections between his personal wealth and military contractor profits from the wars he started (business who donated to him). Though Michael Moore’s film are entertaining, they, like D’Souza’s film, mislead people and manipulate facts while stirring up people’s emotions against their political adversaries. And this is exactly the kind of manipulation that is polarizing Americans and causing disunity.